Psoriasis is a common issue. The Medical Encyclopedia describes the disease as non-infectious, as it affects skin only. 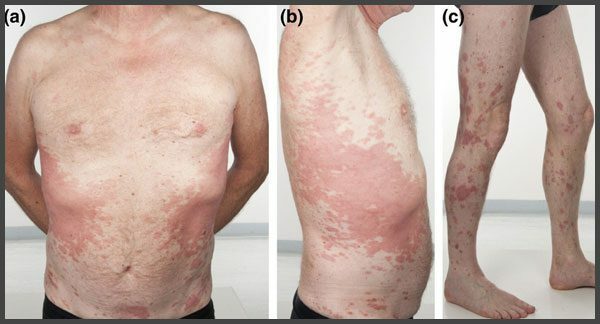 Picture below demonstrate different signs of psoriasis and localizations. As you can see, plaques are clearly outlined, so the disease is quite easy to diagnose. However, it is not the plaques, but impaired immunity, higher risk of other disorders (plaques may cause localized bleeding), and poor quality of life due to severe itching, that make the disease dangerous.